On March 30, 1976, Palestinians living inside the territory seized by the state of Israel in 1948 held a massive general strike to protest Israel's ongoing expropriation of Palestinian land in the Nazareth area--part of its policy of "Judaizing the Galilee." Israeli border guard units killed 6 Palestinians during the strike and injured hundreds more. Palestinians have commemorated the event every year since then as "Land Day." Land expropriation and colonization are at the heart of Zionist policy from the pre-state period until today. In 1948, Zionist para-militaries attacked Palestinian villages with the deliberate aim of driving Palestinians from their land. More than 780,000 Palestinians--over 80% of the indigenous population--became refugees. In the years immediately following, Zionists placed the remaining population under military rule and used a series of racist laws and "Emergency Defense Regulations" both to seize the land of the refugees and to further dispossess the remaining Palestinians. Whereas Palestinians had owned--either privately or in common--the majority of the land before 1948, Zionist organizations and the Zionist state now control some 95% of this territory. In 1967, Israel invaded the remainder of historic Palestine (the West Bank and Gaza), again placing the native population under military law. In the following years, the Israelis began an aggressive policy of land settlement in these newly occupied territories--in many cases using laws and policies similar to those it had used in the territories occupied in 1948: military orders to "close" areas to Palestinians while leaving them open to settlers; the confiscation of Palestinian land for "military" and "security" reasons. --policies aimed at preventing Palestinian economic subsistence and forcing dependency on an economy dominated by Jewish settlers. In the period leading up to the 1976 general strike, a strong resistance movement of Palestinians inside '48 Palestine--with its base in the dense population centers in the north--was clearly emerging. On March 1, 1976, as Palestinians were preparing for the Land Day general strike, Israel Koenig, the Northern District (Galilee) Commissioner of the Ministry of the Interior, sent a top-secret memorandum to Prime Minister Rabin, proposing a range of policies aimed at repressing the growing movement. These included policy recommendations in all of the following areas: reducing the "demographic threat" (e.g. stopping Palestinian population growth); destroying independent Palestinian leadership; disrupting Palestinian strength in the economy; redirecting Palestinian education in order to reduce the numbers of educated members of the "intelligentsia" capable of assuming leadership roles in the nationalist movement; harsher use of the law under a system of "punishment and reward" in order to decrease participation in nationalist political activities. "Expand and deepen Jewish settlement in areas where the contiguity of Arab population is prominent, and where they number considerably more than the Jewish population; examine the possibility of diluting existing Arab population concentrations. Special attention must be paid to the border areas in the country's northwest and to the Nazareth region. ... At the same time, a strong and solid Jewish leadership should be fostered in Upper Nazareth and in Acre capable of facing the expected crucial developments." These recommendations have seen a clear realization through the policies of the Misgav Regional Council and the Markovitz Commission, which have placed the agricultural land and natural resources of the northern region exclusively in the hands of Jewish settlers and have intervened directly through "urban planning" in stopping the growth of Arab villages or even demolishing existing ones. "By having significant control over various spheres of the economy there is the possibility of striking or of noncooperation and thus causing serious damage to the economy and the state, and especially political damage by emphasizing their strength as a factor in the country's economy. ... Appropriate arrangements have to be made with the management of a concern bearing the "approved investment" label in crucial areas. The number of Arab employees should not exceed 20 percent. ... Reach a settlement with central marketing factors of various consumer goods that would neutralize and encumber Arab agents, particularly in the northern areas, in order to avoid dependence of the Jewish population on those agents, especially in times of emergency." "To deny RAKAH [Reshima Kommunistit Hadasha 'New Communist Left', centrally involved in organizing the general strike] its 'priority' in carrying out a national struggle and representing Israeli Arabs and to provide a valve for communities still sitting on the 'fence,' a sister Labor Party should be established in which the stress will be on ideas of equality, humanism and language, social struggle and on raising the banner of peace in the region. The establishment has to prepare itself to maintain covert presence and control in that party." The Koenig Report provides a window into Zionist strategy behind the policies now current in all of historic Palestine: from the continuing policy of "Judaization" in the north; to the "Negev Development Plan" in the south, aimed at "relocating" Bedouins from their traditional lands and concentrating them in "urban townships"; to the confiscation of the most fertile regions of the West Bank for settlement expansion under the aegis of the "Security Barrier." Most revealing of all is the deliberate creation of a parallel opposition leadership aimed at undercutting effective resistance. Through the "peace negotiations" of Oslo, the Geneva Accords, the Road Map and the sham elections of 2005, Zionists have pursued a dual policy of expropriating territory and striking genuine resistance to colonial settlement with crushing force, while at the same time trying to undercut popular support by redirecting it toward a false opposition that stresses "ideas of equality" and "social struggle," and uses a sham rhetoric "raising the banner of peace in the region." 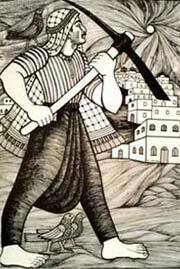 At the same time, Palestinians on the ground have remained steadfast in their opposition to colonial settlement. The Second Intifada in 2000 began with a simultaneous uprising on both sides of the Green Line, affirming a unified political agenda of national liberation and opposition to Israeli Apartheid. The resistance has continually sought and found effective means of exacting a cost against the technologically superior Israeli military and against colonial settlers, in spite of the harshness of checkpoints, the Wall, and the elimination of Palestinian labor from the economy. On Land Day in the year 2005, almost three decades since the uprising of 1976, the Palestinian resistance continues. It is part of an increasingly united regional resistance against Zionism and US imperialism, expressed clearly by the Iraqi resistance, and affirmed in the March 23-27 Third International Conference in Cairo declaring support for the resistance in Palestine and Iraq and opposition to "globalization, imperialism and Zionism." It is equally crucial that the solidarity movement in the US and Europe refuse to be part of a "loyal opposition," and act to support the legitimate resistance in Palestine and Iraq. --to determine both the aims and tactics of their struggle for liberation.